Successful Kansas goose hunting is due to first scouting where the geese are. A strength of the Association of having plenty of farm ponds and lakes inside of crop fields that attract flights. The challenge is the goose has a choice of many spots. The hunter needs to scout to find the spot they pick. Kansas goose hunting is distinguished from that of Missouri and Iowa in two hunt quality aspects. 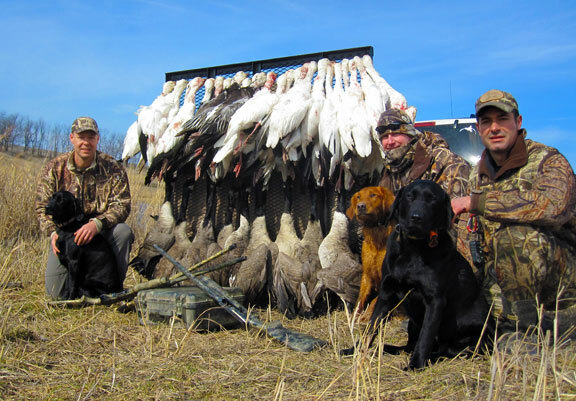 The first is Kansas goose hunting is in the Central Flyway bordering the Mississippi Flyway. Second is that Kansas is known as a drainage state where land surface contour and soil conditions drains water quickly into streams. The single largest watershed in Kansas is the west to east running Kansas River that divides Kansas roughly into a north and south half along highway 70 through the central part of the state. North of the Kansas River the watersheds run north to south from east to central Kansas. Then southeast Kansas is the western fringe of the Osage Watershed coming out of Missouri. These two regions of northeast and southeast Kansas are those of the most water within Kansas. 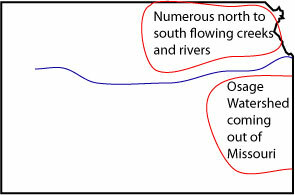 The impact of these conditions is that standing and moving water covers far less surface area than what occurs in Missouri. This make knowing where the larger water bodies exist as a means of predicting flight paths of what is typically a straight forward north to south Migration. 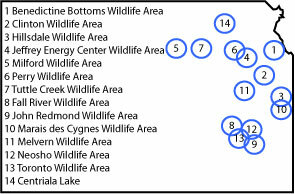 Secondary would be knowing these water body locations relative to setting up on a nearby crop stubble field or pond hunt that is the common Kansas goose hunting location. Using this map combining with our land maps shows a good bit of overlap with these areas and within these areas a fair number of ponds to set up a pond goose hunt and far more crop stubble fields for dry sets. 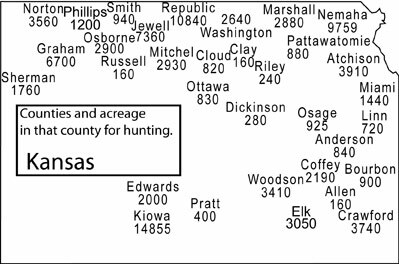 The Kansas map shows relative locations of the largest water bodies within effective distance of our better Kansas goose hunting region on the eastern part of the state. Below the two regions in Kansas with the most still and running water. 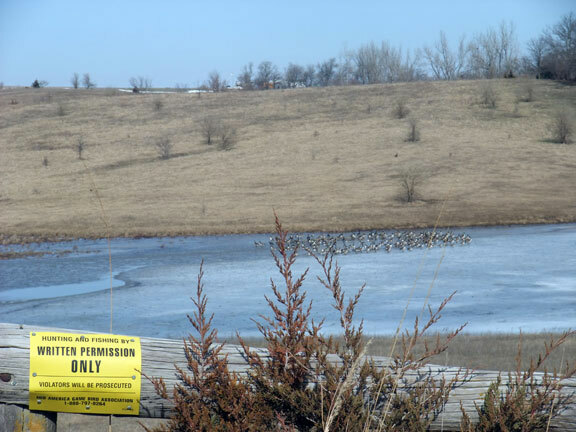 The Association has land in other Kansas regions that also have large manmade water bodies frequented by migrating waterfowl. It is that our operating as a business and not as a hunting club or a public wetlands operator that we are financially motivated to insure the best potential for a good hunt. That drives us to such presentations as this of where to go for the better Kansas goose hunting opportunity. While a combination pond and field set is commonly the first inclination for a Kansas goose hunt it should be recognized that in the central flyway all south of the Dakota Pot Hole Region the main food source for geese will be crop stubble. That include stubble fields well away from water. This combination of land within the region of Kansas that has the better water for the better goose hunts is the extent of the guidance of where to hunt. Beyond this or that which may appear to be more macro than manageable is all that is needed to start the scouting effort for an unguided goose hunting trip. When to hunt seems to include a liberal season with good hunts right through the latest of the late season. What Mid-America Hunting Association does is make the land access easy as we have secured the hunting permission for the hunter. All the Association self guided goose hunter must do is go hunt and do so without the bourdon of finding a landowner to knock on his door or work more pressured waterfowl on a public wetlands. As seen a week after the close of the late season on a Kansas pond. One of our Association signs. Kansas Spring Snow Goose hunt. The give away in this picture is the winter wheat field the Snow Geese were grazing. 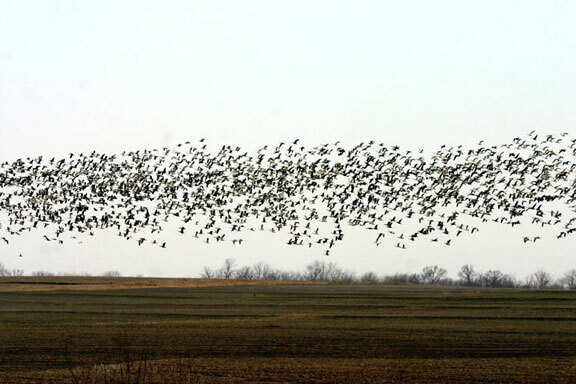 Kansas has more wheat than the soybean and corn stubble fields that are common for Iowa and Missouri field goose hunting.